1. With usage spanning 10,000 years into the past, copper has been used by people longer than any other metal. A copper pendant dating to approximately 8700 B.C. was found in what is now northern Iraq. 2. Beginning around 8000 B.C., copper was used by Neolithic man as a substitute for stone. Around 4000 B.C., the Egyptians heated and mold casted copper into shapes. Shortly thereafter, around 3500 B.C., people began smelting ores, giving birth to the Bronze Age. 4. The processing of recycled copper requires much less energy than the processing of new copper from virgin ore, providing a savings of 85–90 percent of energy requirements. 5. Ranking only behind Chile in copper production, the United States is largely self-sufficient in copper supply. The U.S. produces roughly 8 percent of the world’s copper supply. 6. In 2014, U.S. recyclers processed 820,000 metric tons of copper for domestic use and export. 7. In 2014, around 34 percent of domestic copper was recovered from recycled material with the rest generated from newly mined ore. While wire supply is produced predominantly from newly refined copper, nearly two-thirds of the amount used by other segments of industry, including copper and brass mills, ingot makers, foundries and others comes from recycled material. 8. Slightly over one-half of recycled copper scrap is new scrap recovery including chips and machine turnings, with the rest beingold post-consumer scrap such as electrical cable, old radiators and plumbing tube. 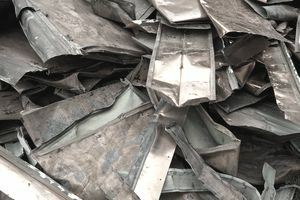 Information for this article was sourced from the Institute for Scrap Recycling Industries (ISRI) and the Copper Development Association.